Planting season is finally here! This unpredictable weather has been hard to deal with lately. I don’t know whether to dress for spring, summer or fall when I wake up in the morning. I was holding back on planting my garden for a while since the danger of frost was still lurking, but I finally got around to it. On the other hand, my rhubarb plant exploded seemingly overnight! I’ve also noticed that the corner I’ve confined my rhubarb to is becoming quite tight, so I may have to thin it out. Any takers out there for some rhubarb? 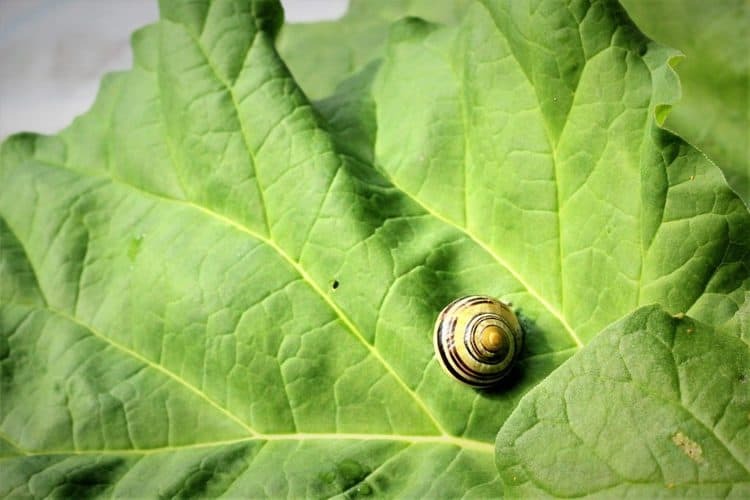 Did you notice the cute snail that I found on the leaf? I actually brought about 3 of them inside clinging to the rhubarb leaves. Don’t worry, I put them back outside. I also noticed that I haven’t posted in a while. Things have been busier with my cooking workshops and catering, so that’s a good thing. I’ve also been working on putting together my very first culinary vacation in Sicily which I’m so excited about! You can read all about it here. Getting back to the rhubarb, this week as I eyed that overflowing rhubarb in the garden I knew it was time to bake something new and blog about it. Now, for someone who’s always mentioned that she’s not crazy about making pie dough, I noticed that my last blog post also included making dough. I guess I’m getting better at it but then again, making pastry dough is a no brainer with the food processor. So at last the first harvest of the season! I made this crostata with my son in mind. He’s practically the only person in our home that will eat it, other than me. I wish I could include in this post the wonderful aroma that filled my home as it was baking. 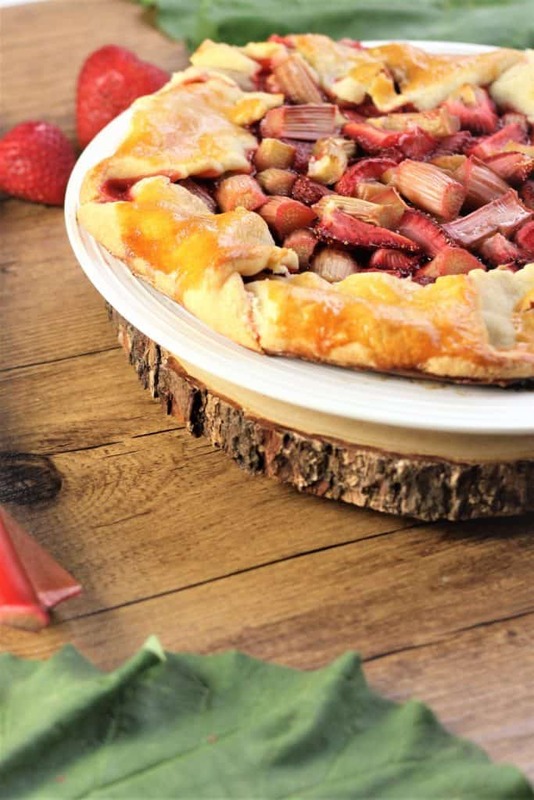 The crust is so buttery, flaky and lightly sweetened and contrasts perfectly with the tart flavour of the rhubarb. You also know that I don’t have much of a sweet tooth so I kept my sugar at a minimum, only 1/2 cup. But you can easily increase to 2/3 cup if you prefer more sweetness in your filling. One rhubarb recipe down, several to go. I’ll probably make rhubarb apple sauce and rhubarb strawberry crisp next. I’m looking for new rhubarb recipes to try out, so let me know if you have any recommendations. This is the first recipe from my garden to table section of my blog of the season and I’m looking forward to several more. Stay tuned! 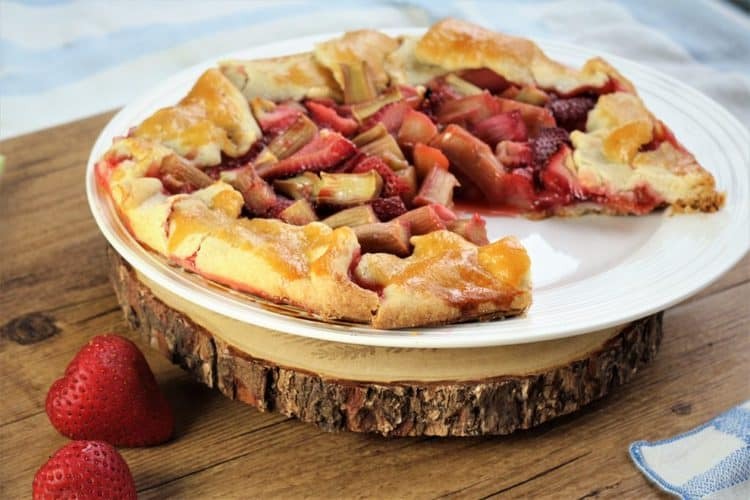 A simple crostata with garden fresh rhubarb and ripe strawberries is the perfect summer treat! For the tart: In a food processor fitted with a steel blade, add the flour, sugar, salt and butter into the bowl. Pulse until the butter has broken down and is the size of peas. With the motor running, add the ice water through the feed tube. Pulse until the mixture resembles a crumbly dough. If the dough is too crumbly add a bit more water. Turn out onto a lightly floured surface and shape into a disk. Wrap in plastic wrap and refrigerate for about half an hour. 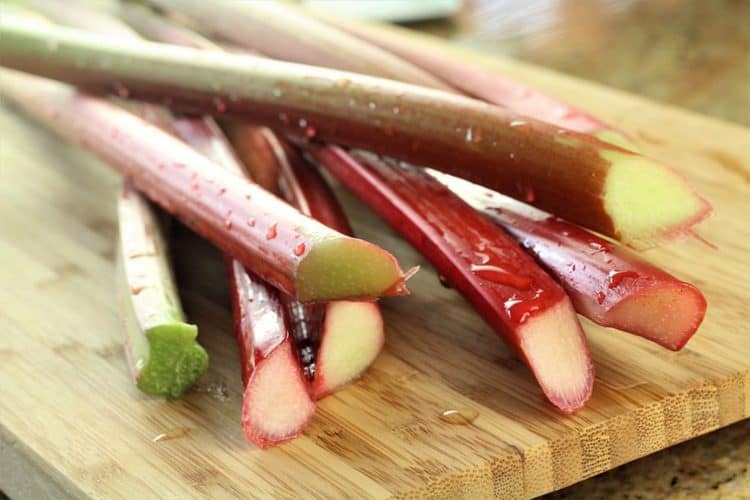 For the filling: Chop the rhubarb into 1 inch pieces. Slice the strawberries into halves or quarters, depending on their size. Combine the rhubarb and strawberries in a bowl and add sugar, cornstarch and toss until well coated. Set aside. 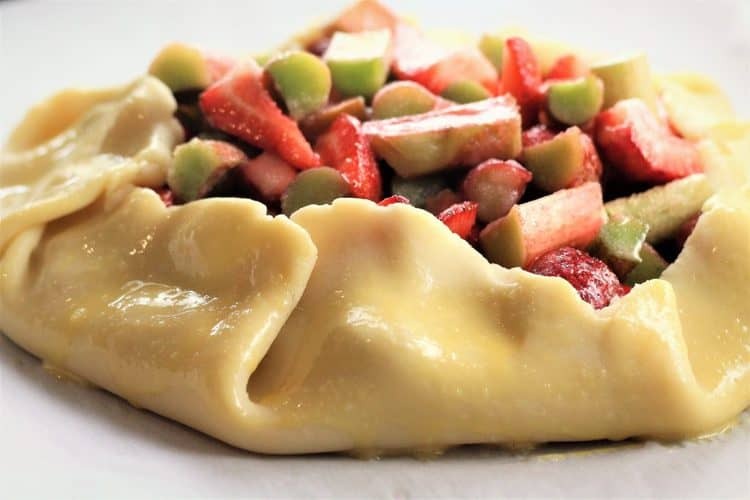 To assemble the crostata: Preheat oven to 350°F. Remove the dough from the refrigerator and roll out on a floured surface into a 14 inch circle. Carefully place on a baking sheet covered with parchment paper. 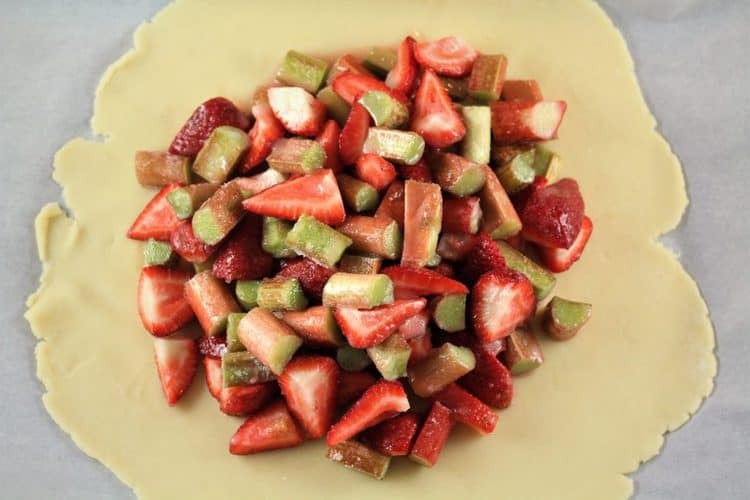 Pour the rhubarb strawberry mixture in the centre of the dough, leaving a 1 1/2 border. Fold the border over the fruit, gently pleating it into a circular shape. Brush the dough with the beaten egg. Bake for 45-50 minutes until the crust is golden and the fruit is bubbling. Transfer to a wire rack to cool before serving. Hi Nadia! This looks so delicious! 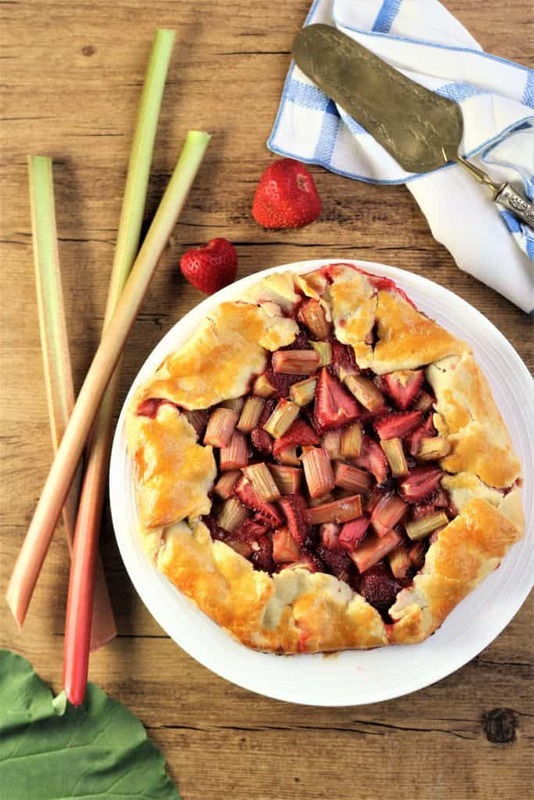 Rhubarb, strawberries, and a buttery crust? It doesn't get any better than this. :-) Thanks for sharing. Thanks for checking out my post Rosa!